Raising a little scientist? Does your child always want to know how things work? 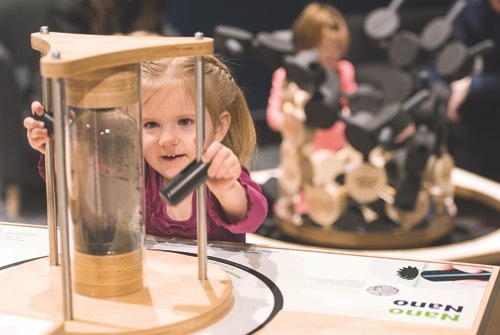 Satisfy their curiosity at one of the many exhibits at the Great Lakes Science Center. The center also has a special area for kids ages 7 and younger called the Polymer Funhouse. Other favorites include the Cleveland Creates Zone, the Science Phenomena Gallery, and the NASA Glenn Visitor Center. Romp n Stomp Activity Center specializes in activities that promote exercise and movement for children up to 10 years old. Kids can enjoy the inflatables, play area, snacks and more during Open Play Sessions, Holiday Events, Camps, and Parents Night Out. Romp n Stomp also is a destination for unique birthday parties. It’s a jungle Amazone — an indoor jungle gym! This is one of the largest indoor playgrounds in Northeast Ohio, with swings, tunnels, and snake pits (just pretend ones!) to explore. Amazone features a toddler playground for smaller kids as well as a large playground. The center also features laser tag, as well as an arcade. Your youngster is sure to start giggling and wiggling the day away in the dance party room. Or maybe she will bound up the climbing structure, or run through the large sports court. The play space is designed for children ages 12 and younger. KidsPlay Indoor Fun features over 2,000 square feet of toys, play equipment, and friendly staff to help children ages 6 and under have a great time. Let your kids start in the ball pit and then head to the slides before going on the pint-sized roller coasters again and again. A communication playgroup for caregivers and their toddlers (15 months to age 3). A certified speech-language pathologist (SLP) provides tips and tricks that focus on language enrichment strategies to use at home during your daily routine, how to model developmentally appropriate speech sounds, identifying social skills needed for playtime with peers, and pre-literacy skills to prepare for preschool. For more information or to schedule a playgroup, contact Lauren Masuga at 216-325-7530. Little jumpers need to be at least 34 inches tall to play in the bounce houses and other equipment at these popular kid havens. While families can reserve Pump It Up for private parties, open jump time is available on a regular basis along with special events tailored to your children’s interests. Across the state there are eight locations around Cleveland and in southern counties. From Toddler Time to Special Needs Open Jump — this has something for everyone. They have programs for kids ages 6 and younger and “Sky Fit” for those 12 and older. Let your child release some energy and get a workout on these indoor trampolines. Teens can play ball while bouncing or jump into a pit stuffed with foam cubes. Also, check out other kid/teen-related special events. Libraries are a treasure trove for youngsters — and for parents. Many locations, such as Cleveland Library and Avon Lake Library and others in the area, offer areas in which children can explore their surroundings. For example, “Cuyahoga County Public Library’s Play, Learn & Grow spaces are like mini-children’s museums where children can engage with interactive play stations and constructive play activities that help build these critical skills,” explains Robert J. Rua, a spokesperson for Cuyahoga County Public Library.